MacDailyNews Take: Mikey, when you “shut it down and give the money back to the shareholders,” it’s implied that you give all of the the money back to the shareholders. Dell was undervalued by The Street much like AAPL is. I disagree that he “stole the company” — he paid more than fair market for it, based on valuation by Wall Street. I know we MDN peeps love to gloat over him, but this one ain’t fair. Whatever, Mike Dell, you cross-eyed, cheating fsck. “whatever”? That’s a pretty clear admission the truth is irrelevant to you. The PE firm paid above the market value. Market value is what someone is willing to pay for something. Apparently, no one was willing to pay more. Big man with a keyboard and an internet connection shooting off his mouth. Now run along and cut the loudmouth BS crap flow from your oral cavity. Because you insist on your view doesn’t make it true. In our judicial system, the truth is based on findings of fact. Vice Chancellor Laster ruled that Dell and Silver Lake did not pay fair market value based on the evidence, including expert testimony, expert reports, witnesses. (And your reference to “market value” is wrong; the standard is “fair market value” – big difference.) It was a long and complex trial with both sides presenting the best case they could. In the end, the findings of fact favored the plaintiffs. What evidence do you have to prove otherwise? If you had any, you would have been subpoenaed to produce it. All you have is just opinion masquerading as the truth. Agreed. MDN’s treatment of Dell mostly over a single quote is about gloating, not reality. Reality is Dell (the company) has been up and down, but pioneered streamlined supply chain management for PCs. Tim Cook is great at that, but Dell was first. And apparently Dell is still quite smart, since he managed to turn a too-low stock price into a huge profit for himself. Every time Apple buys back shares at a surpassed price, those of us who are holding our shares benefit from the bargain. Typo correction: “suppressed” price, not “surpassed”. He paid more than the company was trading for at that moment, but he paid much less than the fair value of the company based on an honest accounting valuation. The shareholders who opposed the LBO were not willing sellers. The company was stolen from them — the buyout was approved only because he manipulated the rules (as clearly stated in the article). And because he unfairly manipulated the rules, then the Judge’s decision is correct. But Dell and his partners will pay only $25 million when they undervalued the company by $6 Billion (read the article to see why). One percent of $6 billion is $60 million and they will pay “only” $25 million. So Dell lost the case, but he wins big. “Fair Market” is not determined by the stock price. That shows nothing more than what one person was willing to sell some tiny piece for. When rigorously determining fair value the most recent stock price plays no part. Fair market value will always be higher than the stock price. A large fraction of Dell stockholders did NOT want to sell at the price offered by Michael Dell and Silver Lake. They were forced to sell when the majority were convinced by the board (who were induced to do so by convenient changes that specifically benefited them). Those individuals who were *forced* to sell sold at a price much, much lower than they would have if they had free will over their sales price. Further, it is now clear that the sale price was not only lower than their expectation price, it was lower than the fair value of the company. Think back to the lowest point in Apple’s evaluation about 20 years ago. You could buy the entire company for just a few billion. Why did no one make a viable offer to take Apple private? Because they knew the company was *WAY* under valued by The Street — Apple’s board knew it too — and any offer would invariably end up in a legal fight over that value. With Dell, Michael was able to convince the board (and by proxy a large fraction of the shareholders) to sell at a below value price. This forced everyone, even those not wanting to sell, to sell their shares and let Michael take the company private. It’s just now being shown that the deal forced everyone to take a below fair price for their shares. I have absolutely no sympathy for those who voted to sell to Michael and Silver Lake. I do think those who voted against selling were robbed — and Michael and Silver Lake knew they were doing the robbing when they did it. He looks like a blow fish crossed with a cabbage patch doll. I’ve run into a few people that happen to look exactly like this, they’re all the trashy, trailer park, dumbass people you’ve run across in high school or at work. Every single one of them. Such petulant bombast! How many millions are you worth, Kate? She is praying the “free stuff” train stops at her (mommy and daddy’s) door. So tell us Kate, is yours a double-wide? What a perceptive and valuable addition to the conversation! Actually, what a knuckle-dragging comment… insulting somebody based on the appearance of their eyeballs!!! Judging by the similar tone of various posts from you, I think there are a lot of “trailer trash” who’d be a lot more pleasant to spend time with than with you. You win the internet stupid comment of the day award. Ire ad your remark and I thought, she’s described her self perfectly – “trashy, trailer park, dumbass ” Grow up little girl. This is stupid. Michael Dell and his partners did what has been done in every single previous buy out in the past: they made an offer that was above the price based on the price established on the open market between willing buyers and willing sellers for the shares in the company. This offer was an acceptable price for those stockholders and the company was taken private by the completion in a willing transaction between those willing sellers and the willing buyers. Some, less than 1%, later come back and say “I’ve changed my mind” after the completion of the transaction and demand a “do over” and a court agrees with them? No, this is not right. I am certain this would be reversed on appeal, but likely it would cost more in legal fees than the $25 million to pay off that noisy 1%. Since this is not a precedent setting case having not reached appellate level, I suspect Dell and his associates will pay and go on their way, regardless of the sense of this decision. Again we see a Liberal judge making a decision based not on law, but on feelings. Because conservative judges always follow the rules, right? Much more often than liberal judges. Liberal activist judges attempt to rewrite law from the bench. Sorry to wake you up, but “activist” judges are not divided by liberal versus conservative. What you really mean is you approve of conservative judges who are activist and not ones you deem as liberal. “justice4All”? Now that is funny. 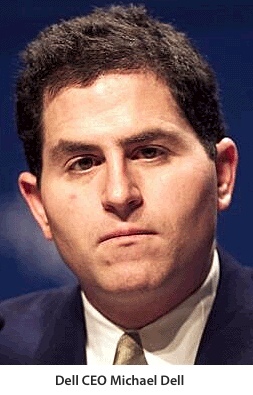 Why would Dell go public again? And who the frack would buy shares?! Oh and Michael: Just an other parasite, aren’t you.